Ahhhhh, October. It’s finally here! At the start of October, I set out to do one new Octivity every single day of the month. That plan quickly fell apart. Life’s been getting in the way. Regardless, we’re one week from my absolute FAVORITE day of the year– HALLOWEEN! Hocus Pocus has been on repeat for days, I’ve already got my plans for mischief night in the works, and I’ll be revealing all the gory details of my costume in the days to come. Until then, I’ll be sharing some festive recipes to get us all in the mood for some spooky (and scrumptious) fun. Of all my favorite childhood memories, the ones involving food always stick out the most, (clearly a sign of what was to come. Hi, I’m Megan, and I’m a sugar-holic.) and my memories of Halloween are no different. Growing up, whenever the end of October crept around, my mom would make popcorn balls. They’ve always been synonymous with autumn for me, so I set out to update her recipe! These babies are simple, delicious, and festive. Plus, they’re almost as fun to make as they are to eat. 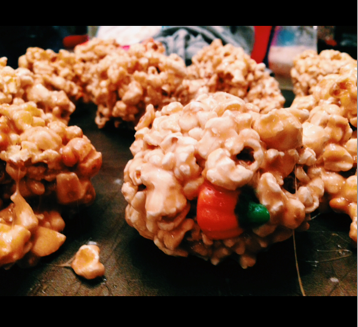 Popcorn balls: my Halloween indulgence. add-ins: candy corn, reese’s pieces, etc. Melt the butter, syrups, and sugar in a pot over high heat, stir until smooth, creamy and dreamy. Once the mixture comes to a boil, add in in the powder and tartar. As the mixture becomes foamy, pour the whole thing over the popcorn. Add in your add-ins at this point, should you desire extra delciousness. Mix quickly! Unless you have bionic hands that do not burn, I’d suggest waiting a few minutes before molding. Use this time to slick up your hands with God’s gift to us all, aka butter. After about five minutes, begin to mold your caramely popcorn into small balls–about three inches in diameter. Set on cookie sheet to harden for a bit (one episode of Broad City should suffice). After your treats are firm, wrap in plastic wrap and tie with festive ribbon. Enjoy! Happy halloween, boys and ghouls! I believe I will implement this recipe into the Autumn festivities. Thanks!